Inspired by Key West architecture, beautiful craftsman style home built by West Bay Homes in the exclusive gated village of Watermark in Seven Oaks. Spacious 5 bed/3 bath floor plan w/ 2nd floor bonus room, 5th bed & full bath. First owner lived in house part-time; it has been meticulously maintained & further upgraded by current owner. Upon entering, notice abundant natural light, charming plantation shutters, crown molding & tray ceiling in formal dining room. Conservation views enhance the atmosphere of almost every room. Wooded views & tranquil waterfall will wash away your cares as you enjoy the privacy of your salt water pool w/ no rear neighbors. Designer custom kitchen will beckon friends and family to gather around the huge granite island, while the cook enjoys 42â raised panel cabinetry, SS appliances, built in oven & microwave, soft-close drawers, and pull-out shelves. 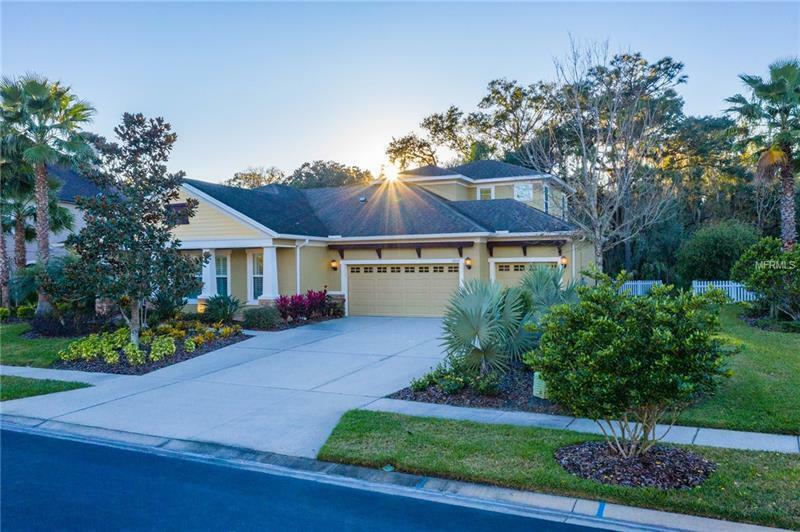 Extended master suite is an oasis w/ tray ceiling, seating area w/ view of woods and pond, entry to lanai, and luxurious en-suite bath w/ granite counter, dual sinks, walk-in shower & garden tub. Upgraded landscaping w/ accent lights completes the ambiance. Seven Oaks elementary is a short walk away. Nearby AdventHealth hospital, Wiregrass Mall, Tampa Premium Outlets, I75, SR 54 and 56, and Bruce B Downs all make Seven Oaks a highly desired location. Seven Oaks community offers scenic walks, pool w/ spiral slide, splash park, playgrounds, tennis courts, clubhouse with fitness center, theatre room, and special activities and more.